, a learned German divine and historian, was born at Nimeguen, in 1482. He studied classical learning at Deventer, and went through his course of philosophy at Louvain with such success, that he was chosen to teach that science; and in that university he contracted a strict friendship with several learned men, particularly Erasmus. He made some stay at Antwerp, whence he was invited to the court of Charles of Austria, to be reader and historian to that prince; but, not liking to attend him into Spain, he entered into the service of Philip of Burgundy, bishop of Utrecht. He was his reader and secretary twelve years, that is, to 1524; after which, he executed the same functions at the court of Maximilian of Burgundy. Being sent to Wittemburg in 1526, in order to inquire into the state of the schools and of the church at that place, he faithfully reported what he had observed, and confessed he could not disapprove of a doctrine so conformable to the Scriptures, as that which he heard there; and upon this he forsook the popish religion, and retired towards the Upper Rhine. He married at Worms, and taught youth there for some time. Afterwards he was invited to Augsburg, to undertake the same employment; and at length, in 1534, he went thence to Marpurg, where he taught history for two years, and then divinity to his death. He died of the plague, Jan. 10, 1542. 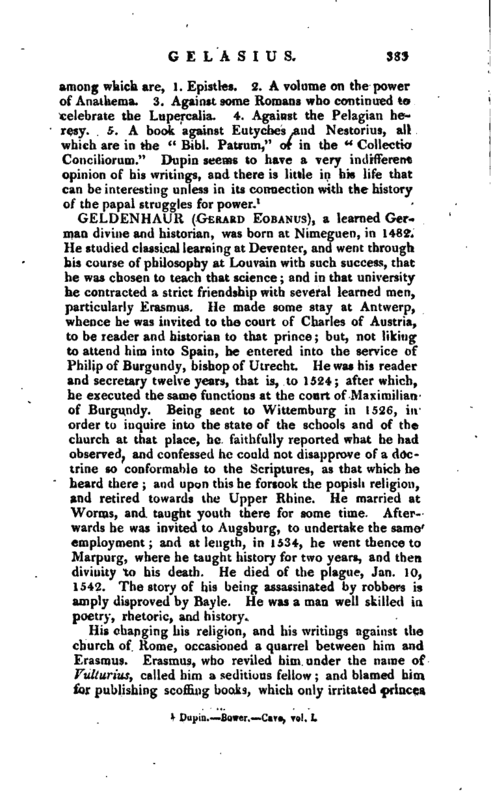 The story of his being assassinated by robbers is amply dispfoved by Bayle. He was a man well skilled in poetry, rhetoric, and history. His changing his religion, and his writings against the church of Rome, occasioned a quarrel between him and Erasmus. Erasmus, who reviled him under the name of Vulturius, called him a seditious fellow; and blamed him for publishing scoffing books, which only irritated princes | against Luther’s followers. He blamed him also for prefixing the name and some notes of himself to certain letters, the intent of which was to shew that heretics ought pot to be punished. 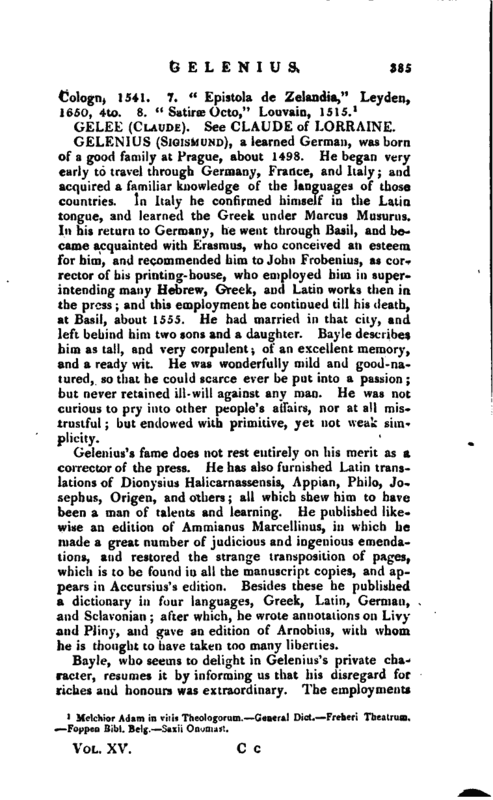 This was exposing Erasmus to the court of Rome, and to the popish powers; for it was saying in effect, that Erasmus had furnished the innovators with weapons to attack their enemies, which Erasmus resented for no better reason than that he was afraid to avow principles which he secretly maintained. 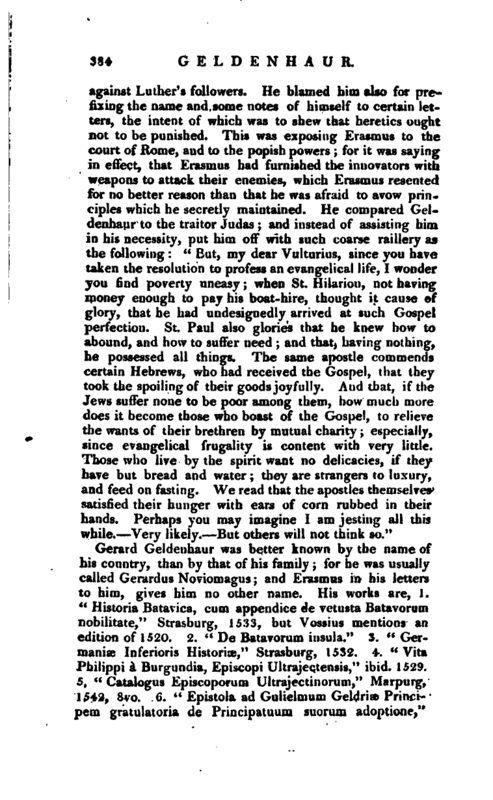 He compared Gelden haur to the traitor Judas; and instead of assisting him in his necessity, put him off with such coarse raillery as the following <c But, my dear Vulturius, since you have taken the resolution to profess an evangelical life, I wonder you find poverty uneasy; when St. Ililarion, not having money enough to pay his boat-hire, thought it cause of glory, that he had undesignedly arrived at such Gospel perfection. St. Paul also glories that he knew how to abound, and how to suffer need; and that, having nothing, he possessed all things. The same apostle commends Certain Hebrews, who had received the Gospel, that they took the spoiling of their goods joyfully. And that, if the Jews suffer none to be poor among them, how much more does it become those who boast of the Gospel, to relieve the wants of their brethren by mutual charity; especially, since evangelical frugality is content with very little. Those who live by the spirit want no delicacies, if they have but bread and water; they are strangers to luxury, and feed on fasting. We read that the apostles themselves satisfied their hunger with ears of corn rubbed in their hands. Perhaps you ma.y imagine I am jesting all this while. Very likely. But others will not think so." Melchior Adam in vins Theologorum. General Dict. Freheri Theatrum. Foppea Bibl. Belg, —Saxii Onomast.